Begin by cooking and cooling your rice, chopping and preparing all of your ingredients so you are ready to go. In a large pan or wok, heat 1 tsp. vegetable oil to a high heat. Once hot, add your ginger and garlic, followed by chives, continuing to stir-fry until fragrant and softened, approx 1 minute. Push your ingredients to the back of the wok, add teaspoon of oil followed by the rice, stir fry for a couple of minutes. Add the kimchi and combine well for an extra 3 to 4 minutes. Stir in your peas, drizzle with sesame oil and remove from heat. 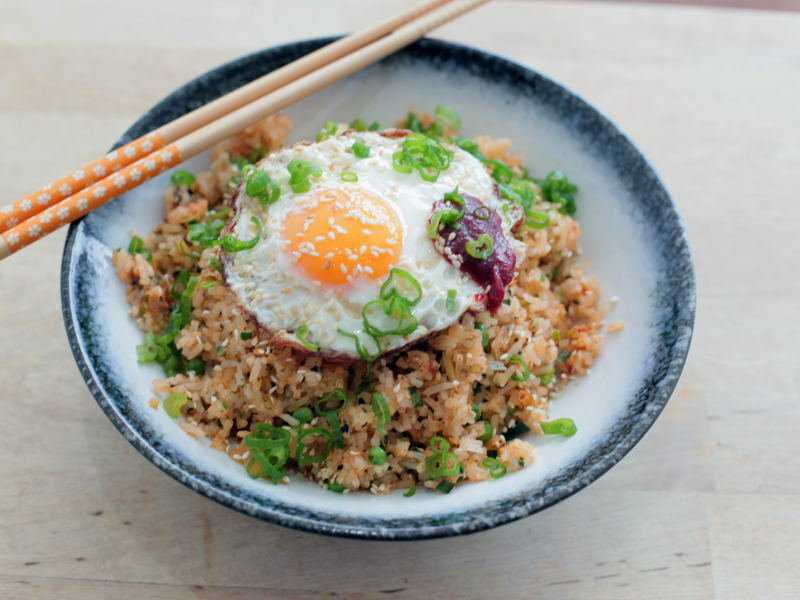 Sprinkle with sesame seeds and spring onions to garnish. Top with a fried egg to make it extra special.